Weeping cherry trees are ornamental trees that are members of the Prunus genus. They are often grown from grafts placed on standard rootstocks. Grafting branches onto rootstocks helps to ensure uniform appearances and protects against disease and pests. Ornamental trees are noted for their shallow, spreading root systems and need for consistent irrigation. In nature, weeping cherry trees are often cross-pollinated and result with seeds that do not grow true to the parent plant. By grafting a particular tree to a specific rootstock, growers can accurately predict what the mature plant will look like. Nurseries propagate most ornamental species, including weeping cherry, via grafts. A known rootstock is chosen for characteristics like height, growth habit and disease resistance. A young branch is taken from a donor plant and grafted on the rootstock. Size can also be controlled by rootstock. Dwarf varieties grow from dwarf rootstock. Weeping cherry species, like Pendula, are grafted onto straight rootstock and grow into a graceful, weeping tree. Weeping cherry trees of all species and cultivars feature root systems that are similar to those of other ornamental trees within the Prunus genus. Tree roots are usually 2 feet underground and spread to the width of the tree's canopy. Weeping cherry trees have heights up to 30 feet. Weeping varieties have the potential to spread up to 25 feet. Allow for both canopy growth and root growth. 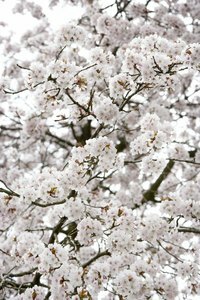 Avoid planting weeping cherry trees near pavement and walkways. Weeping cherry trees require consistent irrigation. Their root systems will not survive a drought. When planted in dry soil the roots are unable to exchange nutrients and water, making the rest of the tree susceptible to a variety of diseases like black knot, fungus and bacteria-caused leaf spot and galls. The weak trees are not able to fend off predatory insects like scales and spider mites. Plant your weeping cherry tree in well-draining soil. Stagnant water and dense soils also compromise root system growth. Wet roots are susceptible to root rot. Keep your tree watered to a depth of 12 inches, watering deeply as needed. Avoid frequent, shallow watering as this weakens an already shallow root system. Sapling trees are usually purchased from a nursery where they are grown in either 1-gallon or 5-gallon containers. Young trees should be at least one year old prior to planting. Their root system is sturdy enough to support the stress of transplantation and young enough to adapt and grow in new soil conditions. Trees in 1-gallon containers do well when planted in protected areas, like a private garden or backyard. Trees that are grown in 5-gallon containers are older than one year and have root systems that are better able to thrive in high traffic areas like parks, front yards and street plantings.